Game Preview: Barrie Colts @ Guelph Storm. #OHL - Very Barrie Colts | A website covering the Barrie Colts of the OHL. Ponies VS. Storm this season. The Storm have managed to “weather the Colts’ this season. They pulled off a 5-4 OT win in late October of last year. For the most part this was a tightly contested game. 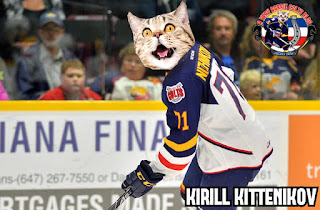 Kirill Nizhnikov scored first for the Colts. Anthony Stefano put up a goal and an assist, former captain Cordell James and former defenceman Matt Brassard also put up a goal each. Rookie Tom Hedberg and Justin Murray both finished the night with a pair of assists as well. Special teams and shots made this contest tight with both teams ending the night with 35 shots on goal and having similar success on the PP. Barrie went 2 for 6 and Guelph went 1 for 3. The game would end just before the halfway point of overtime with Noah Carroll getting the game winner for the Storm. David Ovsjannikov got the start for Barrie and made 30 saves. 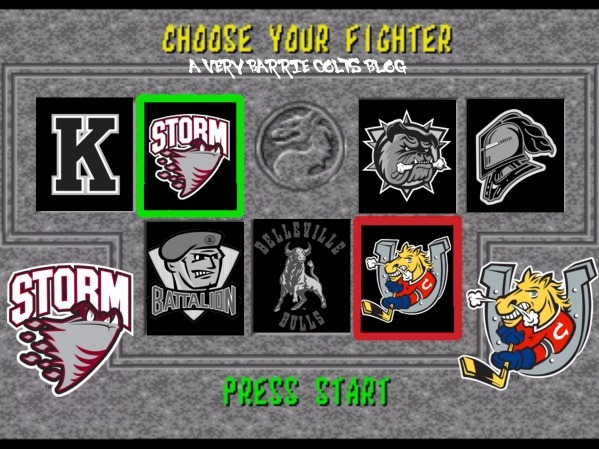 Sarnia Sting weather the Guelph Storm. Guelph lost to Sarnia 6-2 on Wednesday night. The loss was their 3rd straight. Guelph was down by a pair of goals early when Dmitri Samorukov would score his 4th of the season to cut into the Sarnia lead. Sarnia would strike back quickly to regain their 2 goal lead. The 1st ended with Sarnia leading 3-1. Sarnia would score again before Guelph scored their second, and final goal of the night. Former Barrie Colt Givani Smith scored his 21st of the season. Sarnia would score one more goal to complete the 6-2 victory. Guelph was heavily outshot 48-28 in the loss. Rookie Anthony Popovich got the start but was pulled during the 1st intermission after allowing 3 goals on 13 shots. The loss was his 12th of the season. Liam Herbst came in relief to start the 2nd period and made 30 saves on 33 faced shots. Guelph had a tough night on special teams. They were 0 for 6 with the man advantage and allowed 2 goals on 5 penalty kills. Barrie won a game! Then they lost a game. Barrie lost Saturday night against the Peterborough Pete’s in a 4-1 game. Barrie trailed in the first period but managed to tie things up on Roy Radke’s 14th goal of the season. That would be it for Colts production. Rookies Kyle Heitzner and Curtis Douglas both got assists on the Radke goal. Barrie went 0 for 5 on the power play. Ruan Badenhorst got the start and had a strong night in goal stopping 34 shots on goal. Faceoffs were a struggle on the night with Barrie only winning 24 of 66. Ben Hawerchuk really struggled in the circle winning only 5 on 22 attempts. The clash of two struggling teams. Guelph, you got to feel for though. The team, unlike the Colts, is in a very competitive division in the Midwest. They have managed to get 4 more wins than Barrie against more difficult competition. In the Midwest division, the Strorm are the ONLY team that has scored fewer goals than allowed. In the Colts central division, no team has more goals for than against(as of Feb,16). The Mississauga Steelheads are the only team who are close having 187 goals for and 187 against. Also, the second last placed team in the central has 42 points which is 7 more than the Colts. The second last placed team in the Midwest has 62 which is 21 more than Guelph. All that in mind, Barrie and Guelph are both bad. I would look for Propp to get the start though it could be anyone. Puck drop set for 7:30.